This voice is something else, it belongs to her as surely as the things in this room do. It's one thing Ana has always known about herself. In the shadow of a mountain in small-town Tasmania, a woman named Ana is watching the clock, marking the days until she ends her life. The strange, reclusive daughter of the local pariah, that's how the people will remember her, when they remember her at all. No one will mourn her, she reasons, not really. Not even her faithful dog River. The only thing she's waiting for is the opportunity. Lynne Vincent McCarthy is a script advisor and screenwriter and has worked as a Development Executive at Screen Australia, Screen NSW and Screen Tasmania. 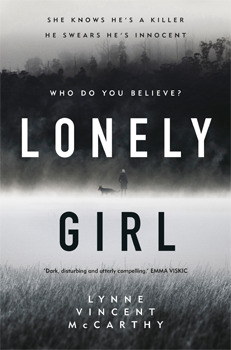 Lonely Girl is her first novel. It has also been developed for film. She lives in Sydney.